The thing was that no-one could ever remember what the five tests were (they are here if you are interested), but they were enough then to keep the UK out of the Euro at Gordon Brown’s insistence. Some Labour folks I know even had the tests printed up onto pledge cards, echoing Labour’s famous cards from the 1997 election. So how about bringing the tests back, in a new form, for Brexit? Much has been made of Keir Starmer’s insistence on the government needing a plan for Brexit, and that this must be presented to MPs before an eventual vote on triggering Article 50 (more on that here), but how is anyone suppose to believe Labour has a credible threat? Sticking down five simple criteria or tests, and keeping on repeating them, might be a start. 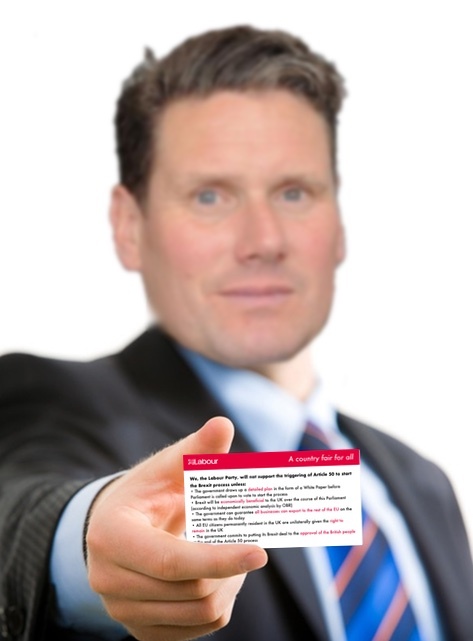 So here you go, Keir, here’s your ready-made pledge card! By all means quibble with the content of the tests, but how about it as an idea? The UK government has promised a Brexit plan. But what does that mean? @rapscallion – which pledge do you disagree with then? You want to go ahead with Brexit even if it were to damage the UK economy or exporters do you? If you do then please say so! Which part of “you lost the referendum” are you lot struggling to come to terms with. The People voted OUT by 52% to 48%. For God’s sake deal with it! The problem being, of course, that there was a referendum vote in favour of Brexit in a way that there wasn’t for the Euro. If Cameron had put these tests before holding the referendum, then maybe.